16 MB maximum memory (because of the 24-bit address bus of the 286), compared to the PC's 640 KB maximum. 1.2 MB 135mm (5¼ inch) floppy disk drive (15 sectors of 512 bytes, 80 tracks, two sides) stored over three times as much data as the 360 KB PC floppy disk (nine sectors of 512 bytes, 40 tracks, two sides). However, they had compatibility problems with 360k disks. 90mm (3½ inch) floppy drives became available in later ATs. The combination of the faster clock rate, fewer clock cycles per instruction, and the 16-bit bus led to a computer that was in the marketing sense too fast. IBM was protective of their lucrative mainframe and minicomputer businesses and consequently ran the original PC AT (139 version) at a very conservative 6 MHz with one wait state. They also used a three-to-one interleave on the hard disk, even though the controller supported two to one. Many customers replaced the 12 MHz crystal (which ran the processor at 6 MHz) with a 16 MHz crystal, so IBM introduced the PC AT 239 which would not boot the computer at any speed faster than 6 MHz, by adding a speed loop in the ROM. 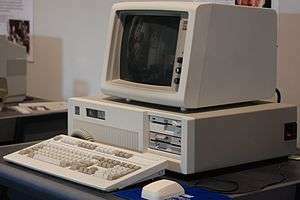 The final PC AT, the 339, ran the processor at 8 MHz with one wait state, and was built as IBM's flagship microcomputer until the 1987 introduction of the PS/2 line. As of 2011, modern PCs still maintain nearly complete backwards compatibility with the PC AT from a software perspective, but AT mechanical and electrical compatibility is extremely rare. The AT power supply pins and its connectors, the AT motherboard form factor, and the physical ISA bus slots are no longer present on modern PCs outside of specialized embedded designs. The ATX standard from Intel has completely replaced the original AT power supply and motherboard design. Modern motherboards do not have ISA expansion bus connectors any more, but a functionally equivalent bus lives on as the modern LPC bus for software compatibility. Nearly all PC BIOS ROMs, even modern UEFI based ROMs, include code which is backwards compatible with the original AT BIOS interrupt calls. Even the 0xaa55 signature in the master boot record is still required by many BIOSes to be present on an attached hard disk for it to be recognized as a valid boot device. The PS/2 successor to the AT keyboard interface still survives in the modern market, though it is increasingly being replaced by USB in new systems. The PS/2 keyboard interface is identical to the AT keyboard interface except for the connector: the AT uses a 5-pin DIN connector, while the PS/2 uses a 6-pin mini-DIN. The AT had three BIOS versions dated January 10, 1984, June 10, 1985, and November 15, 1985. Original models supported 15 hard disk types, with this being expanded to 23 in the second and third BIOSes. The 6/10/85 BIOS fixed some bugs and added support for 720k 3.5" floppy drives while the 11/15/85 BIOS added support for 101-key keyboards and 1.44MB 3.5" floppies. ATs with the older BIOSes will nominally work with 101-key keyboards, but the extra keys are ignored unless the user writes his own code to read them. If 3.5" 720k floppy drives are used on ATs with the 1/10/84 BIOS, they are assumed to be 360k 5.25" floppies and the FORMAT command in DOS will attempt to format them as such. In addition, DOS cannot access anything but the first 40 tracks of the diskette. To solve this problem, two separate utilities were provided with DOS 3.x, DRVPARM and DRIVER.SYS, which modify the BIOS parameter table and inform the operating system that a 720k drive is present. Software on self-booting diskettes (mainly games) does not have this problem since the diskettes have their own internal disk access code. This same situation also applies to using 1.44MB disk drives on the older AT BIOSes, except that they are assumed to be 1.2MB disks. ↑ Somerson, Paul (Nov 13, 1984). "AT the Party". PC Magazine: 123. Retrieved 5 July 2014. ↑ "IBM PC AT". www.vintage-computer.com. ↑ Ziff Davis, Inc. (26 December 1989). PC Mag. Ziff Davis, Inc. pp. 53–. ISSN 0888-8507. ↑ N. MATHIVANAN (2007). PC-BASED INSTRUMENTATION: CONCEPTS AND PRACTICE. PHI Learning Pvt. Ltd. pp. 227–229. ISBN 978-81-203-3076-4. ↑ Howard Austerlitz (2002). Data Acquisition Techniques Using PCs. Academic Press. pp. 90–91. ISBN 978-0-08-053025-3. ↑ Brendan Horan (26 March 2013). Practical Raspberry Pi. Apress. p. 146. ISBN 978-1-4302-4972-6. ↑ Tom Shanley; Don Anderson (1995). ISA System Architecture. Addison-Wesley Professional. pp. 441–444. ISBN 978-0-201-40996-3. ↑ Dickinson, John (1985-06-25). "The AT's Slipped Disk". PC Magazine. p. 55. Retrieved 28 October 2013. ↑ Richard W. D. Nickalls; R. Ramasubramanian (1995). Interfacing the IBM-PC to Medical Equipment: The Art of Serial Communication. Cambridge University Press. p. 25. ISBN 978-0-521-46280-8. ↑ Scott M. Mueller (2011). Upgrading and Repairing PCs (20 ed.). Que Publishing. p. 882. ISBN 978-0-13-268218-3.